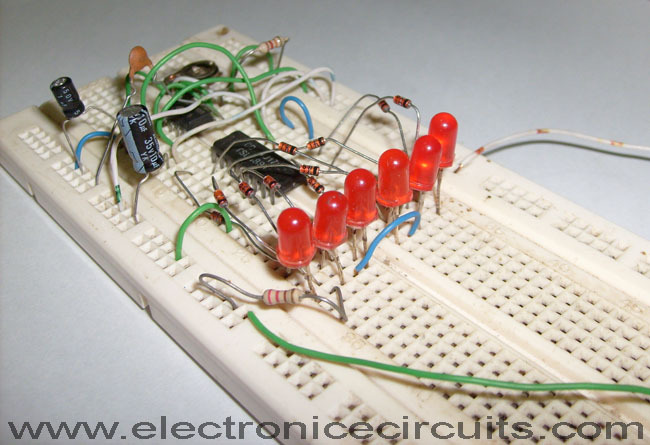 In this 4017 Knight Rider circuit, the 555 is wired as an oscillator. It can be adjusted to give the desired speed for the display. 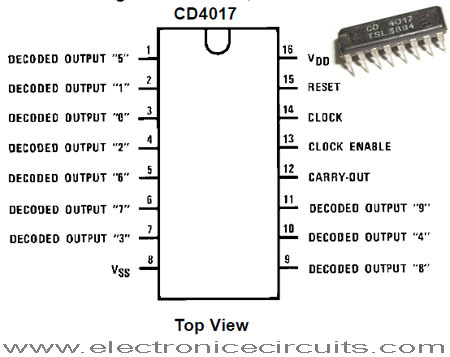 The output of the 555 is directly connected to the input of a Johnson Counter (CD 4017). The input of the counter is called the CLOCK line. The 10 outputs become active, one at a time, on the rising edge of the waveform from the 555. Each output can deliver about 20mA but a LED should not be connected to the output without a current-limiting resistor (220Ω in the circuit above). The first 6 outputs of the chip are connected directly to the 6 LEDs and these “move” across the display. The next 4 outputs move the effect in the opposite direction and the cycle repeats. The animation above shows how the effect appears on the display. Using six LEDs, the display can be placed in the front of a model car to give a very realistic effect. The outputs can be taken to driver transistors to produce a larger version of the display. I know it’s like 6 years later but it goes to 14. 3rd Pin will go to 14th Pin of 4017IC.. & 8, 13, 15 PIN will be shorted…. 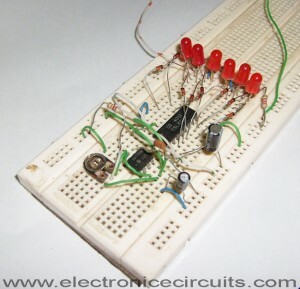 You have to give power Supply on 16th PIN… Hope your problem is solved.!! wow.. man…. itz nicely working.. maxxa.. thnx a lot..
is it working as the real knight rider?? I mean LEDs going fade? 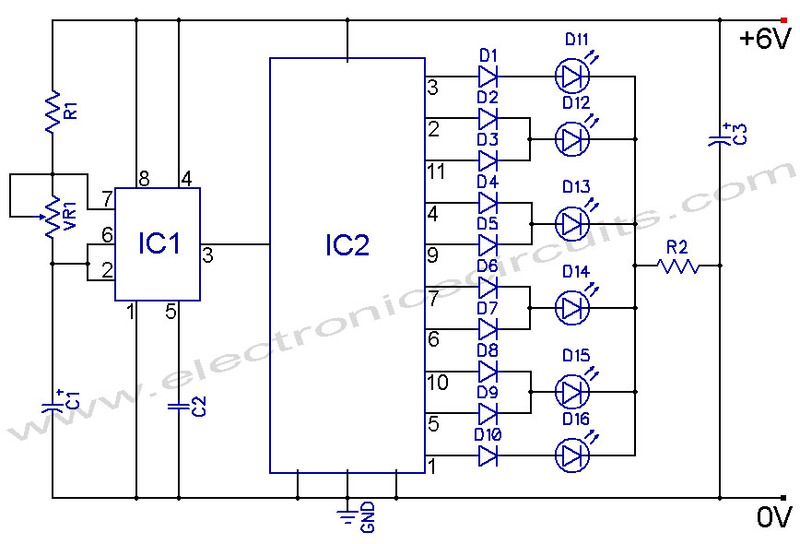 Pls send two LED bulb circuit(robo circuit) daigram. Where is pin 12th of ic4017 Is connected? Pins 3 and 1 of the 4017 IC do not need the added diode. Any reverse flow will be handled by the LED on those leads. It’s working very good even on 9V. CD4017 pins 13, 15, 8 are connected to the GND and the 16 to +V. Pin 3 on NE555 is connected with pin 14 on CD4017. This does not work. Period! Then you are doing something wrong. Period. Try again. Try harder. 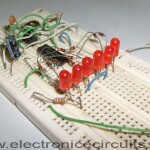 1 Pings/Trackbacks for "4017 LED Knight Rider Circuit Diagram"